The text reads: "This is where I live, so things will work properly here (if I am elected)", "Circle number 22", and a vandal has added "white revolution.sk", the website of the Right and Justice party. Many individual SaS candidates have their own billboards which they presumably have paid for themselves; placed 22nd on the party list Juraj Droba will likely not enter parliament based on the party vote and will need votes for him personally to have a realistic chance. The text reads: "We are raising (a new generation who will win) the world championships (of ice hockey)! ", "New law about sponsoring (for ice hockey training programs)", "Let's vote SNS, number 4". This is yet another attempt by SNS to diversify its nationalist and populist messages by appealing to Slovakia's sense of pride in sporting achievement. The 'baby' wearing the gold medal is Marek Uram, a hockey player and political candidate for SNS; it will be interesting to see if this sort of ploy can reach the right sort of voters (those who probably wouldn't otherwise vote) and bring SNS some support for reasons other than the usual anti-Hungarian, anti-Roma sentiments. The text reads: "An agreement with Slovakia", "Are you going to join too?". This is one of just a handful of SDL billboards in the 2012 campaign, they seem to have a much smaller advertising budget this time around than they did for the 2010 campaign. The 'agreement' with Slovakia they are referring to is part of the party platform, intended to establish themselves as a left-wing alternative to SMER. During the 2010 campaign there were suggestions that the party was being used as a decoy to draw left-wing votes away from SMER, with funding and support provided by backers of SDKU and other right-wing parties. The text reads: "Let's turn the state right-side up", "We are the right solution", "Change from below, democratic union". Ján Budaj takes a more light-hearted approach with this billboard, rather like the SaS ads for the 2012 campaign. The choice of party name "Change from Below" suggests a movement led by common citizens, in much the same way that 99% and Ordinary People do. Ján Budaj may have name recognition with many voters, but the party has effectively no chance of entering parliament after the 2012 election. The text reads: "Cooperation without prejudice", and a vandal has added the words "Enough, get out". 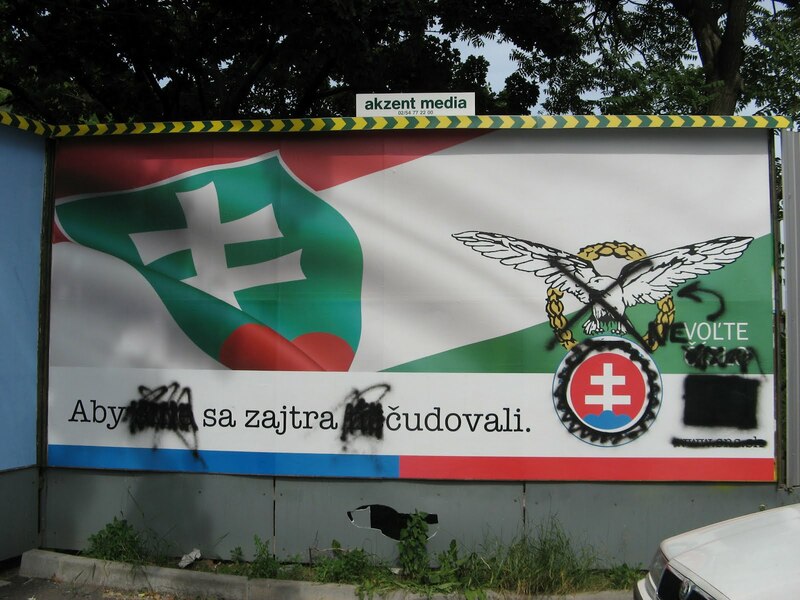 This is another Most-Híd billboard offering a message of reconciliation between Slovaks and Hungarians which is written only in Slovak. They seem to have decided that including Hungarian on billboards frightens away some potential Slovak voters, so Hungarian is only used on advertising in towns and regions with larger Hungarian populations. The text reads: "16% flat tax", "Let's be the best in the EU! ", "Let's vote for SNS, number 4". A vandal has helpfully added the words "You thief" across the image of Slota. SNS seems to have decided that if they want to make it into parliament again this time they can't only focus their campaign on bashing Hungarians and the Roma (which is their usual plan), they actually need to have other party issues. The economy is an area SNS doesn't usually get involved in, but since it is a top priority with voters SNS needs to show that they are in touch with the needs of today's citizens. 'So could you explain your tax plan to us in more detail, Mr. Slota?' 'Well, umm.....". The text reads: "Let's remove the Mafia from politics", "Change from Below, Democratic Union". Ján Budaj is the sort of person who has the moral authority to make statements about cleaning up politics, given his status as a famous former anti-communist activist. However, it seems unlikely that his party will have much impact at the polls since the current election environment has many small new parties that are all offering essentially the same message of fighting corruption. The text reads: "If politicians can manage to approve billions (of Euros) for the Euro bailout fund, they should know how to increase the minimum wage too", "I'm also part of the 99%", "99% wants a change for the better". 99% has made increasing the minimum wage a major part of their campaign platform, in keeping with their pledge to promote the needs and concerns of common citizens. Such populist proposals are fine, but the party seems to have little else to say about what they would do in government. The text reads (in Slovak and Hungarian): "Teaching (schoolchildren) in the mother tongue! ", "This issue needs a solution". 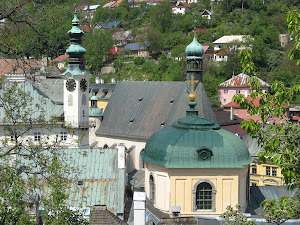 SMK continue to face a difficult battle in the 2012 campaign with Most-Híd, and it looks unlikely that they will enter parliament for the second election in a row. This message represents Hungarian concerns that future state language laws under a SMER government may further restrict education options for minorities. This billboard was just a few metres away from an SNS billboard demanding the exact opposite, that Slovak should be the only state language everywhere in the country. The text reads: "One of our priorities is: Raising the minimum wage", "We are common citizens from all of Slovakia", "We are also (part of the) 99%", "99% wants a change for the better". Billboards promoting 99% are everywhere ahead of the 2012 election, but few people have any idea exactly who is running the party or who most of the top candidates are. Rumours abound about who is paying for their advertising which includes many TV ad spots. The current post-Gorilla political environment has led to many new populist left-oriented parties attracting support, though 99% is less likely to make it into parliament than Ordinary People (OS). The text reads: "For 140 years we have protected Slovak territory! ", "(Viktor) Orbán's boat is sinking". 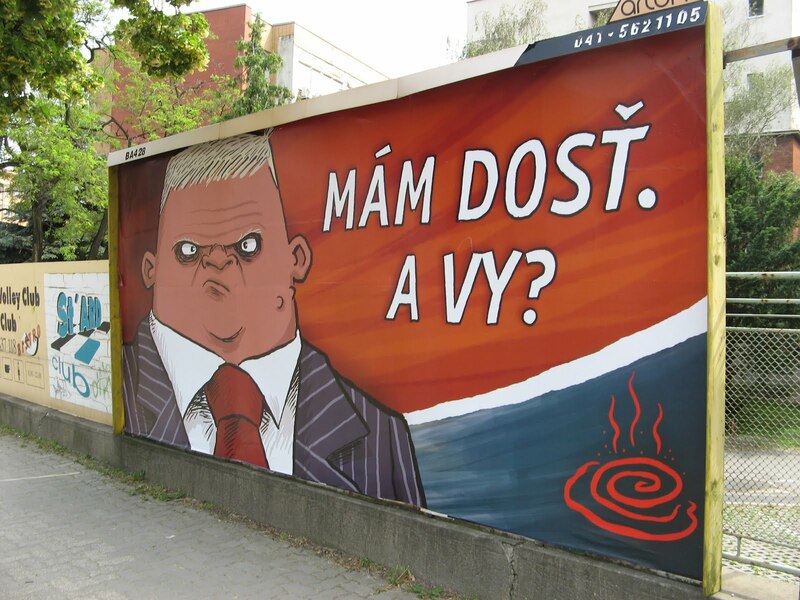 This is one of my favourite SNS billboards of the 2012 campaign because of the cartoon Orbán next to the cartoonish Slota. The Hungarian economy is indeed on shaky ground at the moment and Orbán has led Hungary on a heavy-handed path of consolidation of power resulting in frosty relations with Brussels, but I'm not sure I can agree that Orbán's political boat is sinking. Fidesz are low in the opinion polls, but no other party (especially on the left) has appeared which could realistically challenge them, so the support Fidesz is losing is going into the undecided column or to the extremist Jobbik camp. If Jobbik succeeds in becoming a major political force in Hungary this would be far more dangerous for Slovakia than any moves made by Orbán. The text reads: "I love number 9 (the number on the ballot paper)", "We are protecting the health of the natural environment", "The Green Party - it belongs in government". The green party ran on the SDL party list in 2010, but for 2012 they have decided to go it alone with their own campaign. Despite heavy advertising coverage in the capital, it is very unlikely that the Green Party will attract more than 2% of the vote. Environmental concerns have never been a top issue for Slovak voters, and certainly not at the moment when there are bigger economic issues afoot and gorillas to worry about. The text reads: "I've taken our flag from Slota, he doesn't have the right to hide behind it", "I'm voting for people. And you? ", "Independent candidate for Slovak parliament". Ordinary People is a new party for the 2012 campaign headed by political activist Igor Matovič. Hlina is suggesting with this billboard that SNS leader Ján Slota uses nationalism as a shield that protects him from needing to answer questions about other relevant issues, such as 'How did you pay for that sports car, Mr. Slota?'. It looks as though Hlina would like to wrap himself in the nationalist flag in the same protective way that Slota does, so it doesn't make him appear particularly trustworthy either. I'd like to see if Hlina will go along with Matovič's requirement that all OS candidates take lie detector tests about taking bribes. 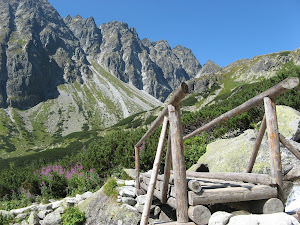 The text reads: "From the Tatra Mountains to the Danube River only in Slovak language! ", "Let's vote for SNS, number 4". This is a typical anti-Hungarian message from the SNS, but I wonder if the Rolling Stones should get their lawyers on the phone about the use of the tongue image? If Tublatanka didn't want to be associated with Slota, I'm sure Jagger wouldn't either. The text reads: "Let's vote with heart (for #18, HZDS)". This is the one and only HZDS billboard I've seen in Bratislava in the 2012 campaign, they seem to have decided that the capital is a lost cause and are focusing their advertising budget on the central and eastern parts of the country where they can attract more voters. This looks like the last gasp of a party that has nothing left to offer - if the best reason they can give voters to support them is 'vote with heart' (which sounds like a vote out of pity) this may truly be Mečiar's last campaign (with HZDS at least, running for President is another matter). The text reads: "Gorillas are robbing Slovakia, while people are struggling to live on the minimum wage", "Don't vote for Gorillas, vote for people! People with the right priorities", "You are also part of the 99%", "99% wants a change for the better". This is a new party for the 2012 campaign with a middle-of-the-road populist campaign platform of fighting corruption following the Gorilla scandal. They seem to have lots of money to spend on advertising (it's anyone's guess where it comes from) but there isn't much substance to the party or its policies yet. Most of the people on the party list are unknown to the general public, though 99% says that is the point, to have a list of candidates who represent and understand the public's point of view. The use of the Gorilla theme in ads is popular with voters, and they may be able to sneak into parliament with around 5% of the vote simply based on their trendy name and advertising. The text reads: "The fight for justice isn't finished", "A good reason to vote for SDKU". Lucia Žitňanská is the current Justice Minister, and a very capable one too. She has passed extensive legislation that will strengthen the integrity and efficiency of the justice system and fight corruption. She is widely predicted to become the future leader of the SDKU if (when?) Dzurinda agrees to step aside, though if the party does not enter parliament there may not be much of a party left to lead. If a merger of right-wing parties eventually occurs to create a united alternative to Fico, she would be a strong candidate to lead it. The text reads: "A stronger Slovakia", "It starts with (hard) work", or it can also mean "It starts with jobs (for Slovaks)". KDH are using the same message of job creation on all their billboards with different candidates. Lukáš Pokorný is number 51 on the KDH candidate list, so he stands almost no chance of entering parliament through the party vote share. He needs to convince voters to circle his name on the ballot to increase his position. The text reads: "Slovaks, let's start relying on ourselves! ", "100 Euros per month increased minimum pension", "For people - pensioners, who built this country", "We have a new solution! Let's vote SNS, number 4". SNS seem to be making a concerted effort to go after older voters in the 2012 campaign, since many of their billboards focus on raising pensions. The slogan about 'relying on ourselves' seems to suggest that they think the EU (with its economic issues) will not guarantee Slovakia's long-term future, in keeping with SNS's nationalist and often isolationist message. The text reads: "Are you already angry and disillusioned by everything that has happened (with the Gorilla scandal)? ", "Don't vote for those which stole from us and deceived us", "Let's vote for number 7", "Right and Justice supports (the website) white revolution.sk". This is another new party with lots of advertising but little substance to their platform beyond claiming to be nationalist corruption fighters. The large letters on the billboard which are first seen by the viewer, "Let's not vote" will attract the attention of those who are against all the political parties and likely would not go and cast a ballot for any party. Their 'white revolution' website pushes for an anti-corruption campaign using symbolic white ribbons, rather like those used in late 2011 by anti-Putin protesters in Russia. On the other hand, the 'white revolution' tag also makes the party sound like an advocate for extreme nationalists and white supremacists, unintentionally or not. The text reads: "Modernised schools", "For more jobs in Slovakia." 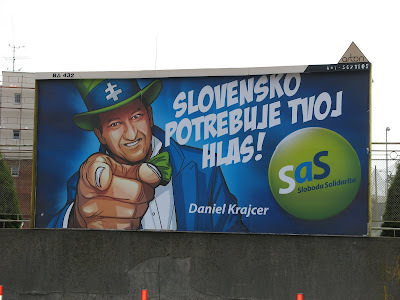 All SDKU advertising for 2012 has a clean, conservative, "we are the party for grown-ups" look compared to other right-wing parties such as SaS. The text reads: "(Leading) responsibly for the country". 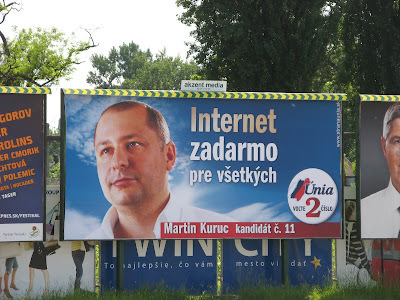 Unlike the 2010 campaign which featured only Bugár's image on the billboards, for 2012 they have decided to include many different Most-Híd candidates. The design of the 2012 billboards is only slightly different from the 2010 version with the same stripes of orange and white. Another thing to take note of is that this ad does not include the slogan in both Slovak and Hungarian, unlike most of their billboards in the 2010 campaign. 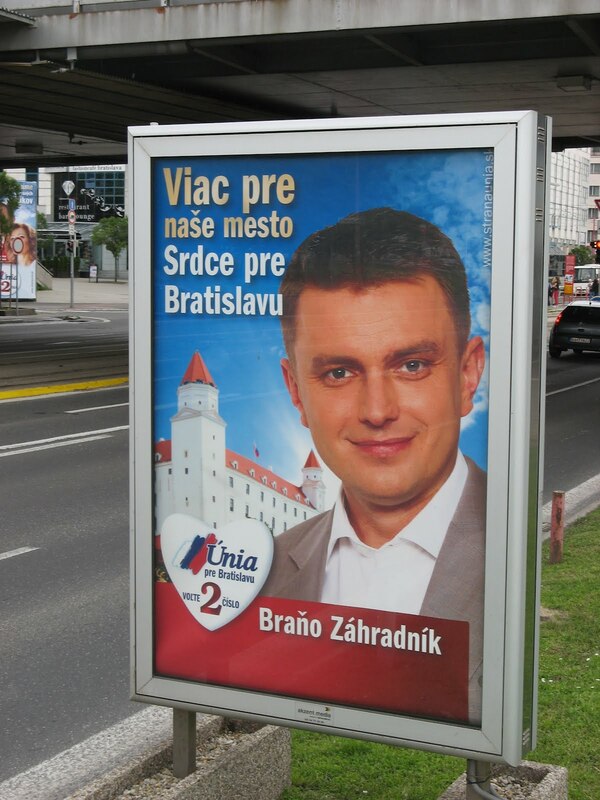 They seem to have decided that they will have a better chance with ethnic Slovak voters in the capital if the advertising is given only in Slovak. The text reads: "People deserve certainty", "Let's vote for SMER, number 11". 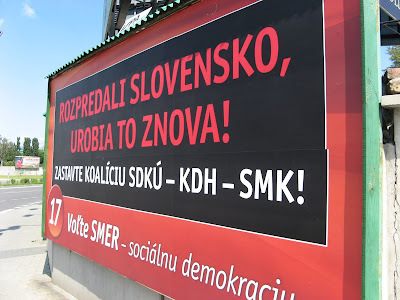 SMER are using a simple, uncluttered billboard design for the 2012 campaign, with the same look and slogan used on all billboards with photos of the different candidates. Leader Robert Fico has declared that the country needs a ruling coalition that is capable of governing for a full four year period, and it seems rather likely that he will soon be able to form such a government. The text reads: "We will increase pensions by 1200 Euros per year! ", "Vote for SNS, number 4". 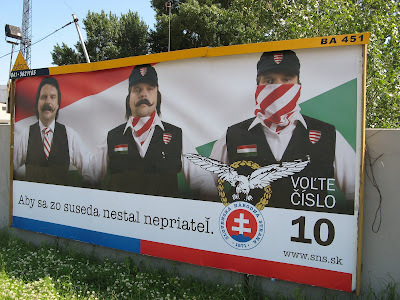 Most of the billboards used by the SNS in the 2010 campaign focused on creating fear of Hungarians or Roma, so it is interesting to see them offering plain populist campaign promises like this one. They seem to have decided that the economy is a more important issue to focus on this time, since the SNS are polling below 5% in most opinion polls (as of mid-February 2012) and they need a new approach. The dark, frightening images of some past billboards have been replaced by a friendlier white design for all of the 2012 billboards. The text reads: "Cooperation in Europe", "For more jobs in Slovakia". 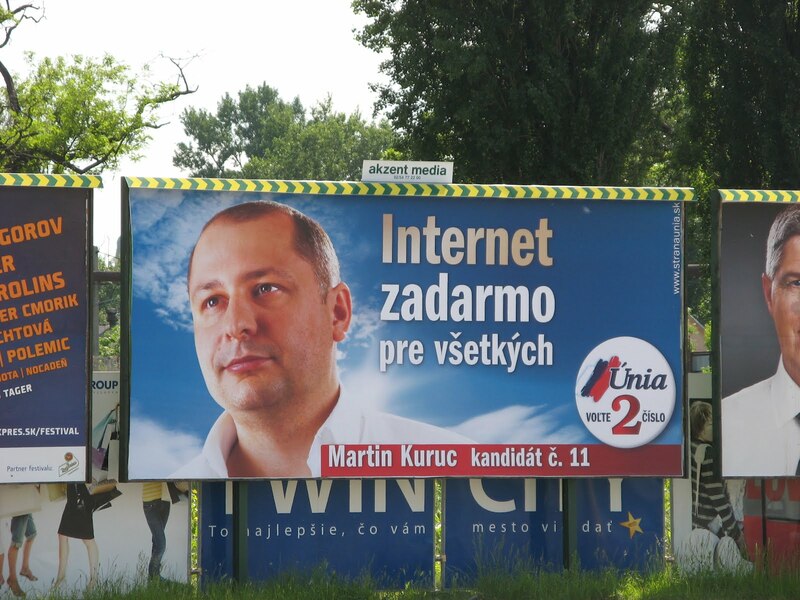 This billboard featuring Foreign Affairs Minister Mikuláš Dzurinda is displayed all over the capital, and surprisingly few of them have been vandalised, given the recent Gorilla accusations against him and the decline of his influence in national politics and his own party. There is a certain desperation in the SDKU camp a few weeks before the vote as opinion polls now either place them at the border of the 5% threshold needed to enter parliament or just below it. It is true that the SDKU typically performs better on election day than the opinion polls suggest, but all bets are off in the wake of the Gorilla findings. The text reads: "We are making Slovakia healthier", "Change from Below, Democratic Union". This is a new party called Change from Below (Zmena Zdola) which was founded by former anti-Communist campaigner Ján Budaj. The party has made little impact in opinion polls so far, despite an extensive advertising campaign. Viliam Fischer, pictured on the left, is a well-known surgeon, so the slogan used here is appropriate. The text reads: "After the 12th of June we want a Slovakia which works for everyone", "and for young families too". Concern for the needs of young families was one of the common themes of the campaign, with several different parties targeting their advertising to focus on this issue. The text reads: "He (Robert Fico) gave power to Slota and Mečiar, he will do it again! ", "Stop the SMER-SNS-HZDS coalition", "Change is in your hands. Come and vote!". This sticker is not affiliated with SDKU, although the designer has used their colours and layout. The message cleverly parodies the SMER billboards which accused the SDKU of past mistakes and claimed that they would do it again in a new SDKU-KDH-SMK coalition. The text originally read: "So that tomorrow we don't have to wonder", but vandals have altered it so that it reads: "So that tomorrow they are wondering", "Don't vote (for the SNS)". This was done the day before the 2010 election, so I assume the altered caption is intended to mean that the SNS will be wondering about their future as a party after the election. SNS and HZDS billboards were popular targets for vandalism and 're-messaging' during the campaign. The text reads: "I have enough (money). Have you (had enough of me)?". This funny portrayal of SMER leader Robert Fico was drawn by Shooty, cartoonist for the newspaper SME. He personally paid for several of these billboards to be displayed, and then he started an online donation fund to get others to help pay for more of them to support the cause to defeat Fico at the polls. The frown on Fico's face isn't too far off his normal expression (he almost never smiles), while Shooty has also redrawn the SMER logo (in the bottom right corner) so that it looks like a pile of smelly crap. The slogan is intended to remind voters that Fico is quite well off financially for someone who claims to speak for the common citizen (and perhaps that he added to his income through corrupt deals during his time in office). The text reads: "Slovakia needs your voice!". Borrowing the American Uncle Sam character is an unusual move in Slovak politics, since it connects SaS to American values, both political and economic. There is a certain comic irony in this image that makes me think it was ineffective and a poor choice for conveying their message. The 'Superman Sulík' SaS billboard was also ironic, but didn't come laden with direct overtones of U.S. influence. The text reads: "Free internet for everyone". This ad contradicts an earlier Unia billboard where they criticised SaS for offering free internet, claiming they were out of touch with the real needs of voters (since many couldn't afford computers). The message reads: "The right way, not the wrong direction", "On Saturday June 12th vote for number 13 - KDH". This is a clever slogan, since it makes it clear that voting for SMER (which means 'direction') is the wrong choice and that voters should choose 'the right way', echoing KDH's main slogan 'We are the way...". The text reads: "They sold out Slovakia, they will do it again! ", "Stop the SDKU-KDH-SMK coalition! ", "Vote for SMER - Social democracy". 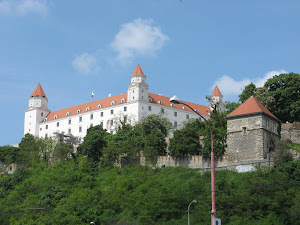 The Dzurinda government which ruled until 2006 created a business-friendly environment with a flat tax rate which rapidly accelerated Slovakia's economy. The effects of these pro-business policies finally began to be widely felt just as Robert Fico took power in 2006, and he quickly took the credit for having created the vibrant economy himself. As a populist party, SMER will always portray themselves as the defender of the common voter, while the pro-business policies of the SDKU (which many rural voters believe only benefit Bratislava) made an easy target. 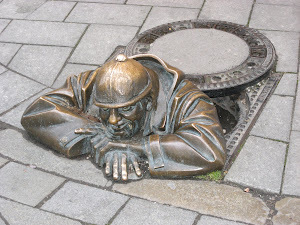 This blog is based on my personal travel experiences while living and working in Russia, Slovakia, Poland and the Czech Republic for ten years. I am now an academic in the field of East European studies, focusing on the politics and history of Slovakia and western Ukraine. 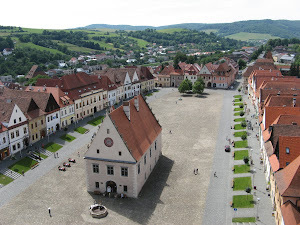 I have a particular interest in the folk culture and wooden architecture of the Carpathian mountains. Eastern Slovakia and Ukraine's Zakarpattya region are my favourite places to explore - I'm familiar with those regions on a village by village level. All photographs and text copyright by Wildroo. Awesome Inc. theme. Powered by Blogger.